If you want to build a ship, don’t drum up the men to gather wood, divide the work and give orders. 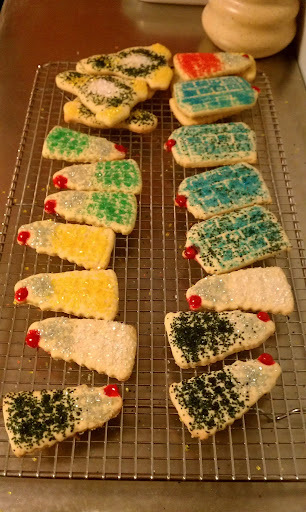 Instead, teach them to yearn for the vast and endless sea. I saw this most recently in Neil deGrasse Tyson’s testimony to Congress. I think it applies very broadly. 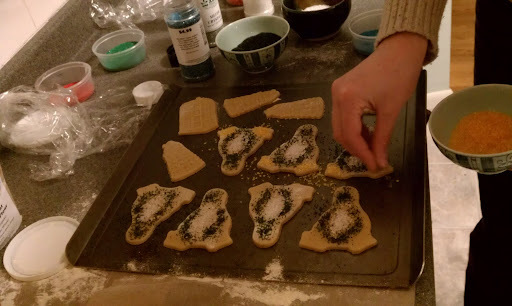 People aren’t machines, and actually react very poorly to detailed mindless instructions. But give them a goal, a vision, something they believe in and think they can do, and you’ll find that you only need to do minor direction to accomplish those goals. Ever wanted to connect your Legos and Tinkertoys together? Now you can — and much more. 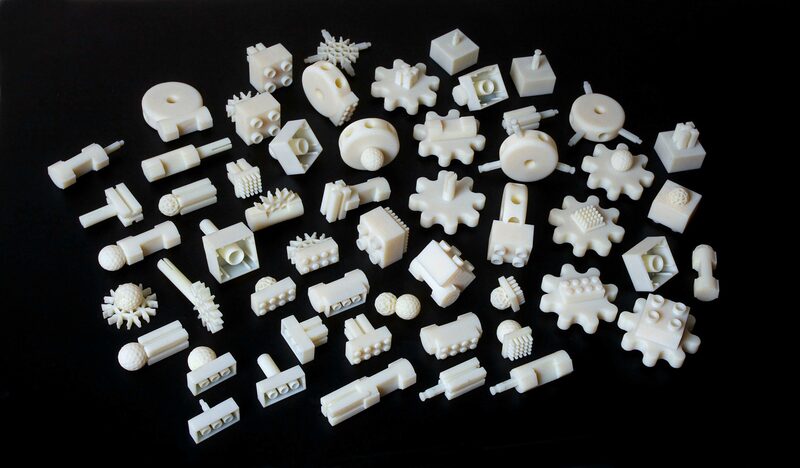 Announcing the Free Universal Construction Kit: a set of adapters for complete interoperability between 10 popular construction toys. I mean wow, just wow. – Fix historic DST rules for Canada. – Add leap seconds for June 2012. This is why you need to apply updates regularly, and make sure you are on a supported distro. I’m very curious how mobile is going to handle this, as this will be the first leap second addition any of the major Smart Phone OSes has ever had to deal with. Last night, after the Drupal Meetup, we were having many interesting conversations at the bar. One started as a question about why I did so much open source activity. There are a lot of answers there, though mostly at this point open source is just in my DNA. If I do something, I open it, because that’s what I now do. But I posed as a return question for everyone to think about what their Google footprint was. If you search for your name, what comes up? how much of that is you? “Sean Dague” in google returns: About 652,000 results (0.14 seconds). I am sure 99% of that is me. Page 1 is (in order): my blog, my twitter account, my linked in profile, my directory entry in android market, a comment I wrote on greenmonk blog, my github, my old (long dead blog), my quora account, my meetup profile, my CPAN account. Some of that is current and used, some of it isn’t so current, but because google ranks the communities important, it bubbles up. If you start going through pages you’ll see contributions to projects I’ve done, bugs filed, mailing list posts, presentations at conferences, retreads of my listings in twitter and android market on 3rd party sites. A public life on the internet that dates back to about 2001 (there may be earlier stuff, but that’s when I started being consciously active in the open source world). I can live with that, it’s a reasonable picture of who I am, that future friends, associates, employers can all use and see for background. The amount of content I put out on my blog means that it will remain hit one for my name. It also means that I’m always on the front page of “Dague” in google as well. Having an uncommon name is actually an incredible boon in the 21st century if you want to build a reputation. Something that I hated as a kid, is something I’m very pleased about now. Much like your credit score, your google footprint isn’t ever completely in your control. But you can be very deliberate about putting out content, in code, comments, emails, blog posts, public social network artifacts, which will shape that footprint to be some representation of you. Take a minute today an look at your Google footprint, and see what picture the internet gets of you. I’d love to hear stories, challenges, or completely new ideas in comments, so please post. And just think, that will also add to and shape your Google footprint. 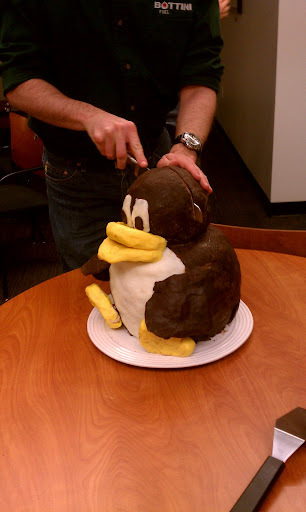 Last night our MHVLUG meeting was a Desktop Shootout, where people showed off their Linux desktop environments what they liked and what they didn’t. I went last, presenting Unity, and got a few good questions and comments about how I did things. The default alt tab behavior drives me nuts, because it collapses 2 chrome windows into a single item. So you can’t quickly use it to flip between 2 browser windows. This is provided by the Unity compiz plugin. Fortunately you can just load up one of the other compiz switchers instead. Run ccsm (Compiz Config Settings Manager) and scroll down to the Window Manangement section. You’ll want to enable “Application Switcher” and configure Next Window (All windows) key stroke there. If there are other questions you think off, please just ask in comments, and I’ll update the post with the answers. 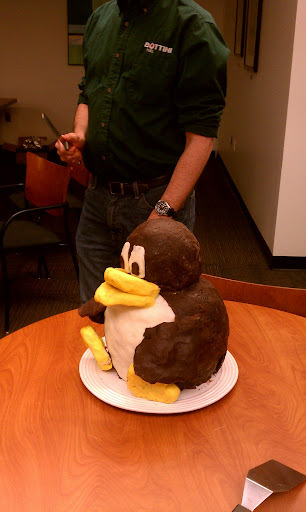 We celebrated last year’s 9th Anniversary meeting in style, with this incredible 3D Tux cake that Pat Ladd made for us. Totally awesome, but what in the world is he going to do to top it for our 10th anniversary? Late today I worked out a Thunderbird RSS issue I’d been having for years (at least 5). It’s the kind of problem that I come back to every six months or so, and this time it got triggered because someone closed the bug I filed. It was a really good feeling. On the way home the thing that came to mind was just the phrase: “never give up, never surrender“. On to the next problem. 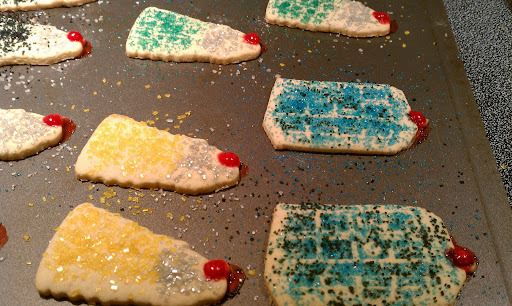 It’s time for the MHVLUG Anniversary, which means geeky baked goods. Thanks much to a trusty friend with a Thing-o-matic I’ve added Daleks and Tardises to go with Tux. Enjoy the pictures. Every year since I first started volunteering for the Poughkeepsie Farm Project we’ve had a pow wow in the fall about what would be the right task list for me to try to get ready by the start of the season in May. For the past couple of years all my focus has been on the website. This year, things are different. While there are still a few things I’m going to do to the website, I’m diving into a brand new space. The PFP, like many organizations it’s size, is largely run by lots of disconnected spreadsheets. A for instance, asking a question about who attended both key fundraising events last year requires hours of effort, as those attendee lists are in completely different formats in different places. So the focus is going inwards, and we’re going to see how much better we can make this with CiviCRM. CiviCRM is an open source customer relationship manager that attaches to an existing Drupal (or Joomla or WordPress) installation. It can handle donations, membership management, event planning and ticketing (including online payment). It was not where I started the investigation, but when I finally came across CiviCRM, and ran it through it’s paces, I was quite happy with what I saw. I’m also really impressed by the development community, who has been super helpful. I’ve gotten a couple of minor patches in already (and working on some more major ones). This is going to be a really interesting journey at many levels. To do this right I’m really learning how the internals of a small non-profit works, and how we map the concepts across. We’ve got some good check points in place, and I think reasonable goals on what functionality I can get online this year. It’s probably a 2 year journey before we really take full advantage of what it can do for us. I’ll be writing about this journey here, and also talking about it very regularly at our Hudson Valley Drupal Meetup. So if you are in the area and are contemplating implementing CiviCRM, or have and could share, come out and find us. 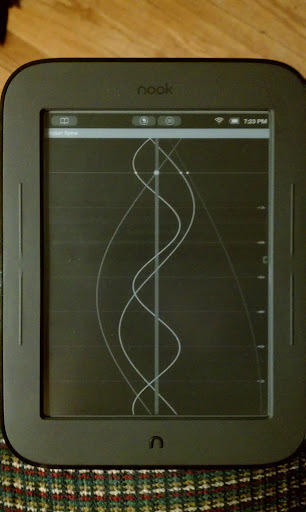 This weekend I bought and rooted a Nook Simple Touch. The reason? 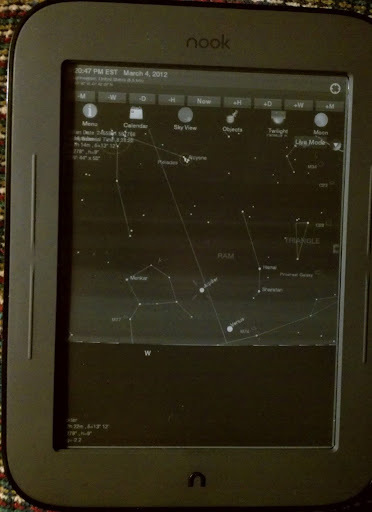 I’ve been looking for an eink platform that one could make astronomy applications and data available for. Eink is ideal for a hobby where stray light destroys your ability to see anything. Having written an astronomy application (albeit one that needs a lot more polish) I pushed it over. There are a few rendering issues with the buttons (which completely confuses me), and the fact that there aren’t any real location services means rise / set times are completely off, bother are fixable in software. Computational speed seemed on par with my HTC Evo, which means this is something I can work with. Sadly, both B&N and Amazon have equivalently limited imaginations when it comes to making Apps for their e-ink platforms (my Amazon knowledge comes from email exchanges with the Kindle team), and don’t see the other possibilties for e-ink. Fortunately, B&N seem to be lacking on having a crack security team, so the Nook ST can be wedged open to an open platform pretty easily. I’ll be making Where is Io optimized to run on it, and look at what it would take to get Google Sky Maps over there (now that it is open sourced). And, I’ll hold out a small amount of hope, that B&N one day figures out it might be useful to provide this additional value to their customers. Based on email exchanges with Amazon, I’ve completely written them off. Key Takeaway: don’t let your own limited imagination, and need for control prevent your creations from meeting their full potential. Update: now that the Android Market finally activated, I pulled down a number of apps to see how they all worked. The Mobile Observatory UI is actually really useful on this size and type of UI, and I think is worth the price of the Nook Simple Touch even if you only decide to run it.